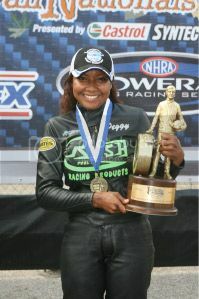 NHRA (National Hot Rod Association) Pro Stock Motorcyclist Peggy Llewellyn has been named celebrity spokesperson for Divas For A Cure (DFAC), to promote breast cancer awareness in Black and Latina/Hispanic communities. Divas For A Cure (DFAC) is a national service-based nonprofit organization dedicated to raising cancer awareness through early detection, education, screenings and supporting research for eradicating cancer among women, specifically Black and Latina/Hispanic. The organization is unique in that its African-American and Latina women ride motorcycles across country to raise funds and awareness throughout the year and participate in their signature fundraiser, Divas For A Cure Breast Cancer Motorcycle Run. Named 2009 Female Athlete of the Year by The Elements of a Champion Foundation for displaying extraordinary character on and off the racetrack, Llewellyn is dedicated to her community through actively being involved with Women’s Sports Foundation’s Go Girl Go! and independently promoting the sport of motorcycle racing, physical fitness education, and following dreams to young girls. Divas For A Cure is led by Founder/President and breast cancer survivor Jan Emanuel-Costley. The four-year organization, supported by Harley-Davidson, clocked over 22,000 miles across the United States for the cause and donated over $110,000 to MD Anderson Cancer Center at the University of Texas, where DFAC has a dedicated treatment room. In past years, Divas For A Cure has enjoyed the support of celebrities such as award-winning, bestselling African American authors Nina Foxx and Eric Jerome Dickey, male supermodel and actor Tyson Beckford, comedian and actor Joe Torry, and Hollywood stunt man and former dancer Lionel Douglass. According to the US Dept. of Human and Health Services, breast cancer is the second leading cause of death among Black and Latina woman, making it the most commonly diagnosed and most likely form of cancer to lead to death in both groups because it is often diagnosed in later stages. For more information, visit www.peggyllewellyn.com and www.DivasForACure.org. I want to thank you for creating such a wonderful blog that highlights the good of others! We see, hear, and read about the not so nice things on a daily basis and it is a pleasure to receive a regular subscription about those who give back. Please keep it up! BTW, I selected you for the Lovely Blog Award on my website. Stop by if you get a chance. @constant gina: Yes, it does for me too. This is a month not only to remember, but to support and spread awareness as well.